It happened in the past, and it could happen again. That is the warning from ocean researchers at the University of Toronto and the University of California, Santa Cruz in a study reported recently in Science that reveals how an increase in CO2 in Earth's atmosphere over 50 million years ago, radically altered the chemistry of the planet's oceans. 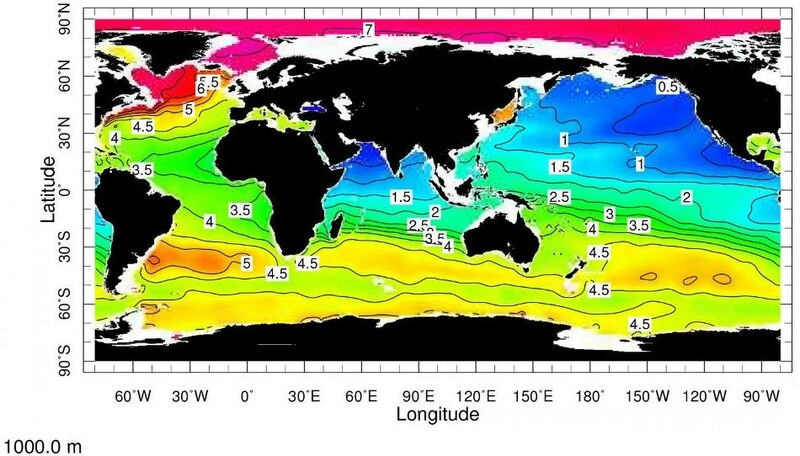 These are oxygen concentrations at 1,000 meters water depth in the modern ocean. Reddish to yellow colors show regions with a high oxygen content. Blue tones depict regions with a low oxygen content that are potentially susceptible to hydrogen sulfide poisoning in a warming world. (Courtesy of Uli Wortmann/University of Toronto). The scientists state if contemporary global carbon emissions continue to increase, the future of a number of fish species in the oceans could be in jeopardy. Also, this is not the first time this has occurred. "We show that the last time large amounts of CO2 were injected into the atmosphere, not only did the planet get hot - which is known as the so called Paleocene-Eocene Thermal Maximum, about 55 million year ago - but it also changed the chemistry of the ocean quite markedly," said Wortmann. He collaborated with U of T PhD student Weiqi Yao, lead author of the research, and Adina Paytan of the Institute of Marine Science at the University of California, Santa Cruz. It is broadly accepted that an increase in CO2 results in warming, which then leads to less oxygen in Earth’s oceans. Less oxygen allows sulfate-eating bacteria to flourish, which creates hydrogen sulfide—a wide-spectrum toxin which is fatal in small concentrations. This will affect fish species that live or dive deep in the ocean. Most notably it would impact high level predators like tuna and whales, which in turn would have a ripple effect on fish species living in the commercially more relevant shallow waters - up to 200 metres below sea level - and those living in the middle depth approximately 1,000 metres below the surface of the ocean. The middle and deep ocean are the largest and least explored part of our planet, home to giant squid and weird deep sea fish but also some commercially important fish like the Patagonian Toothfish, otherwise known as Chilean Sea Bass. The Paleocene-Eocene Thermal Maximum (PETM) obtains its name from the boundary between two periods in Earth's past. The quantity of CO2 input into the atmosphere during the period was like the predicted trajectories of CO2 in the atmosphere towards the year 2100 adopted by the United Nations' Intergovernmental Panel on Climate Change, if emissions continue to increase across the 21st century. It is seen as a good model for the fossil fuel burning activity happening presently and is passionately explored by researchers in the context of climate change. In the course of investigating how ocean chemistry evolved over the last 60 million years, Yao came across some rare data - hinted at in earlier low-resolution work by Paytan - that Wortmann suggests conventional wisdom would consider defective. Upon observing that it overlapped with the PETM interval, the researchers searched harder for more data and were able to reveal that it was no measurement artifact, but a real signal. While the scientists cannot pinpoint how long it would take for the impact of increased CO2 levels to become obvious, they say the change would be rapid. The findings are illustrated in the research paper "Large-scale ocean deoxygenation during the Paleocene-Eocene Thermal Maximum", reported this month in Science. Support for the study was provided by the Natural Sciences and Engineering Research Council of Canada and the National Science Foundation.